Animal magnetism is present throughout the animal kingdom, so why not throughout your home or work, too - at least wherever there is metal for these magnetic sculptures to grab onto. 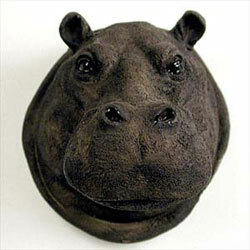 Hippopotamus head is remarkably detailed in stone resin. Magnet measures about 2" to 3" tall.